Ok, a fact is a fact, and if you have a cat, you’re concerned about odor. Frankly, litter boxes are not pleasant on any level, and with the hundreds of cat litter varieties around, who knows what works on odor and what product your cat reject. So, if you’re like me you try them all. But, one thing is essential with any cat litter you choose and that’s to mix in cat litter crystals. I don’t know exactly what’s in those crystals, they look like rock salt, but they work, and Fresh Step Cat Litter Crystals is the very best. And best of all, my cat likes his litter box and never rebels by going outside the box. 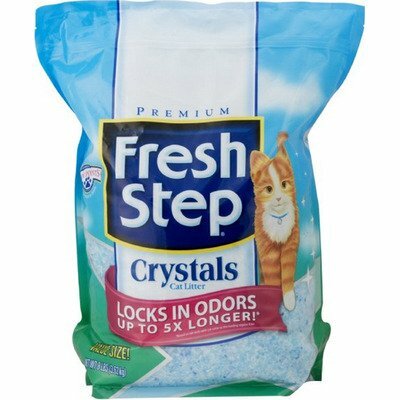 Fresh Step Cat Litter Crystals are safe to use as your exclusive litter. This is fancy since the price is about $12 a bag more for a jug. I can attest if you do this, your house will smell completely free of cats. One drawback of doing this is that the urine does have a tendency to settle under the crystals, not absorbing into the product; thus leaving a puddle in the bottom of the pan at changing time. But again, mix it in with any brand of litter and notice a difference for the better.